discouraged about your etsy sales-to-review ratio? Do you ever feel stressed out about the ratio of your Etsy sales to reviews? If you are a hot-blooded human, you probably have. Of course, as sellers, we always want to see numbers of nearly any kind increase. This includes feedback! We love to see new, positive feedback from customers. It’s a validation of what we are doing, and the way we are doing it. It just plain feels good to hear from people that the work we have done has made them happy. It’s super easy to think that lack of a positive review means someone is unhappy, but that’s not necessarily the case. Today’s episode talks about all of this and more. It is normal and common to feel a little self conscious about the number of reviews you have on your Etsy shop especially if you have a lot of sales and few reviews or if you are a newer seller wanting to build up more credibility. In this episode I’m sharing why this is normal but ultimately not worth stressing about. Also going to be really honest about a problem I think Etsy creates for sellers that has caused a lot of additional stress. Plus I’m telling you about an experience I had with an Etsy admin and their comment to me about the ratio of sales to reviews in my shop. Of course I’ve also shed some light on what actually matters when it comes to reviews, and my own process and thoughts on soliciting reviews (juicy right?!) 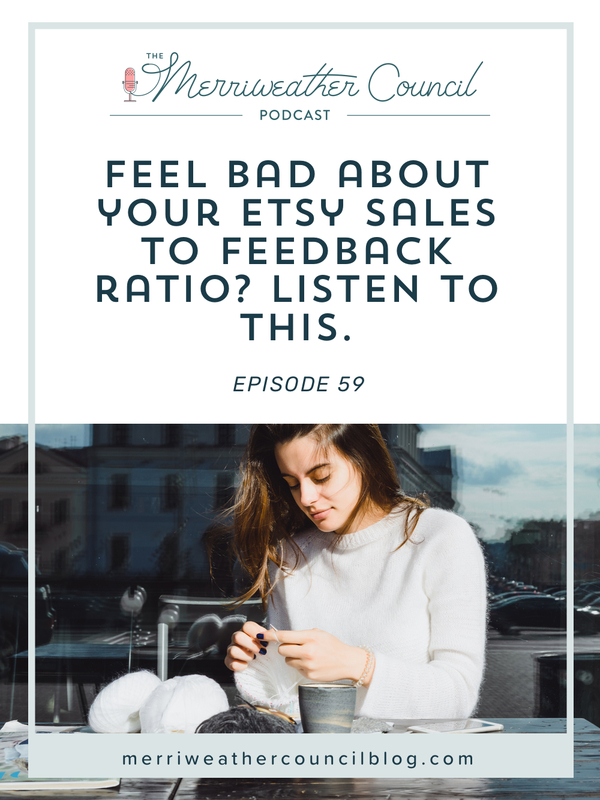 Hopefully this episode helps you Etsy sellers feel more at ease about your sales to reviews ratio! Thank you so much for tuning into today’s episode! Good to know! I do a lot of custom work with lots of convos back and forth…so I think I get more reviews because of that. I have a perfect 5-star rating – about 36%! Of course, my sales could be better but that’s a different issue.